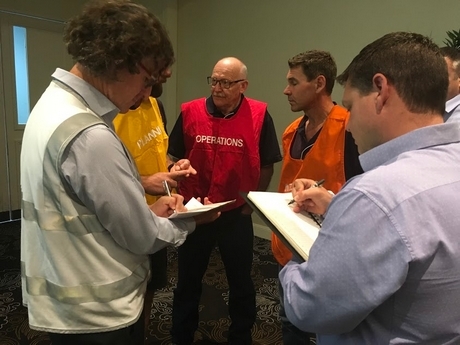 The New South Wales Department of Primary Industries (NSW DPI) is expected to release an official report into a mock exercise in dealing with the state's potential response to an outbreak of Citrus Canker (Xanthomonas citri subsp. citri) later this month. Exercise Orange Juice was held in October in Griffith and was designed to review and evaluate New South Wales’ preparedness for a detection of the exotic disease. 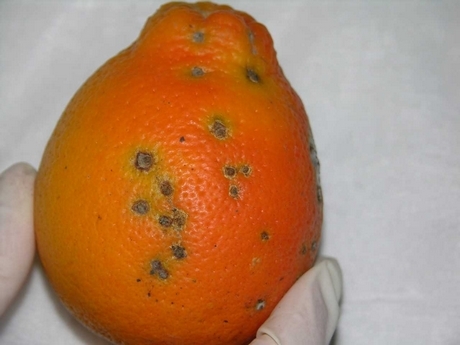 It was based on a hypothetical scenario where citrus canker was detected in a NSW retail outlet. 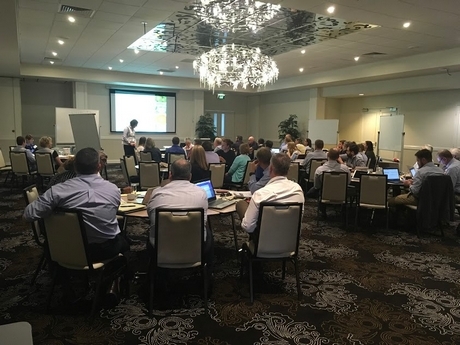 More than 50 participants attended the exercise, including members from both state and federal governments, along with key stakeholders from the NSW citrus industry, as well as Plant Health Australia, Citrus Australia, Nursery & Garden Industry Australia and NSW Farmers. "The exercise was conducted in light of recent citrus canker detections in the Northern Territory and Western Australia," NSW DPI Plant Biosecurity Officer Rebekah Pierce said. "NSW has never recorded an incursion of citrus canker but the current environment of heightened risk makes it an opportune time to evaluate our emergency response plans, our preparedness and response capacity. Multiple outbreaks of citrus canker have occurred in Australia over the past century. The Northern Territory successfully eradicated the first detection of the disease in 1912 and again in 1991. Queensland has also previously eradicated detection of citrus canker from Thursday Island in 1988 and from the mainland in 2004." While the full Exercise Report will highlight the key outcomes identified during the exercise and also provide some recommendations, preliminary findings showed that a key focus was improving and clarifying processes for collaboration between Department of Primary industries (DPI) and Local Land Services (LLS) government entities. In addition to reviewing and updating citrus canker and emergency response resources, such as strategies that are a basis for planning in a citrus canker emergency. "Also, improving industry integration into an emergency response that is predominantly run by government staff," Ms Pierce said. "There are currently some provisions for this in Emergency Management structures, but these can likely be expanded upon given the value of industry input identified during the exercise. There’s always room for improvement in communication, so there will also be outcomes related to this." Citrus is one of most important horticultural industries in NSW with a production area of around 13,000 hectares. The citrus industry is the largest fresh fruit exporter in Australia worth in excess of A$200 million annually. NSW produces around 250,000 tonnes of citrus annually representing 40 per cent of Australian production and 36 per cent of citrus exports. "Citrus canker is such a threatening disease to Australia because of its high entry potential and devastating impact on citrus trees,” Ms Pierce said. “Being a highly contagious bacterial disease, it can be easily introduced to Australia by unwary or illegal importers, and once here has the potential to spread quickly with moisture, such as irrigation or rain. All above-ground parts of citrus trees can be affected by the bacterial cankers. Although the cankers do not directly affect the edibility of the fruit, the cankers are an eyesore and severe infection of the trees can lead to defoliation, dieback, blemished fruit and premature fruit drop. This significantly impacts the overall yield and quality of the fruit produced." The Northern Territory and Western Australia are currently attempting to eradicate citrus canker by removing host plants in high risk zones and undertaking rigorous tracing and surveillance to ensure any spread or additional infections are captured. "Quarantine measures have been put in place and market access restrictions have been placed on host plant material coming from NT and WA into other states," Ms Pierce said. "New South Wales is closely involved in the eradication effort, assisting infected states with staffing and resources, and receiving regular situation reports on the progress of the eradication." The NSW DPI says spring is the most likely time for Citrus Canker to emerge, so residents and growers are being urged to help keep the state free of citrus canker by inspecting trees and reporting suspicious symptoms. "Spring is the key time to look for new canker outbreaks as symptoms are easier to identify in warmer months when conditions are optimal for the bacteria to grow and spread. These symptoms are less aggressive or obvious in cooler months with less agreeable conditions," Ms Pierce said. "The highest risk for new infections is during active growing periods where fresh shoots are emerging, i.e. early spring. Conditions for development of the disease are optimal in warm temperatures, and spread is highest in periods of high rainfall and strong winds. Bacteria enter actively growing shoots and leaves through natural openings, such as stomata and flower openings, and wounds (either mechanical or insect wounds). Latent infections can occur on shoots infected in autumn which will then be the source of bacteria for ongoing infection and spread the following spring." 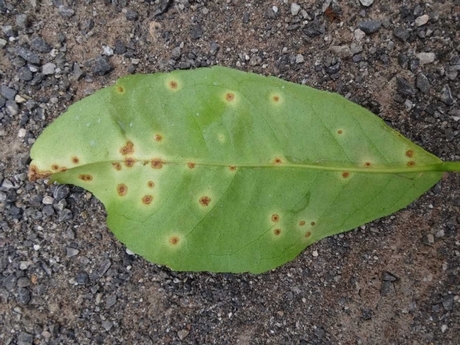 The symptoms of citrus canker include blister-like lesions on the leaves surrounded by an oily, water-soaked margin with a yellow ring around the lesion. Premature fruit can drop early followed by defoliation, twig dieback and general tree decline. In severe cases, it can lead to tree death. More information on identifying the disease can be found in the DPI Primefact. If you suspect citrus canker, do not move suspect plants or material. Report the suspected plant immediately to the Exotic Plant Pest Hotline on 1800 084 881 or join the mailing list to receive regular updates at citrus-canker@agriculture.gov.au.